I reviewed the first issue of this series when it was released. It can be read here. To review my thoughts of that issue, I felt there were two things very wrong with it. First, it launched in the middle of a crossover event. That really does a disservice to a title. Instead of being able to establish its own voice and direction, you’re forced to tell someone else’s story—hardly an ideal way to launch a series. And second, the series launched with art by Greg Land and I absolutely loathe him, as an artist. I’m very please to tell you, both of those problems are now in the past and this issue is everything that the first issue should have been. 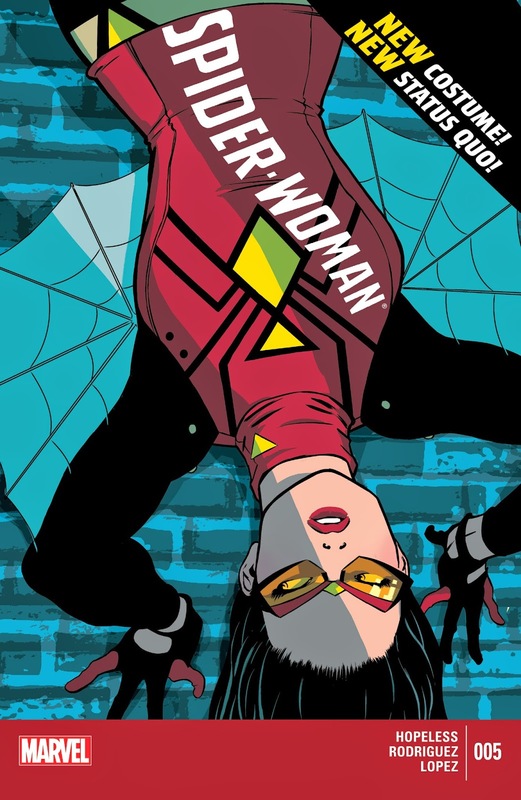 This issue gives us a new direction and a new costume for Jessica Drew. She’s sick of being an agent, whether it be S.H.I.E.L.D., S.W.O.R.D, or the Avengers. She wants to be a superhero that’s in control of her own destiny and not beholden to anyone else. In this story, a bad night of crime fighting lands her in jail. When she gets released, she meets up with Daily Bugle reporter, Ben Ulrich, who wants Jessica (who was, at one time, a private detective) to help him on a story he’s working on. Turns out, family members of super villains are disappearing and Ulrich wants to know why. Jessica is initially against such a partnership, but a chance run-in with a supervillain, who’s only committing a crime because “they” will kill his daughter if he doesn’t comply, changes her mind. Who’s “they”? Was that encounter really completely chance? We’ll find out in the coming issues! As I stated before, this issue was everything the first issue should have been. Hopeless is a proven talent with a wonderful track record behind him with such titles as Avengers Arena and Avengers Undercover, both titles I’d highly recommend. I expect great things from him on this title, now that the shackles of a crossover event are off. Getting an artist like Javier Rodriguez on this book was a real coup. He has a very clean, almost pop art style. His style is quite similar to his fellow artists on Mark Waid’s Daredevil--Marcos Martin and Paolo Rivera. In addition to his excellent work on that series, I’ve seen his work previously on Amazing Spider-Man and he handled art duties on the fantastic Batgirl: Year One. To say that I feel he’s a massive upgrade over Greg Land would be an understatement! The verdict: The new direction and art team have me really excited for this book, so much more than at its launch. Both creators have proven themselves in the past to be quite capable and shouldn’t disappoint us in the slightest. Highly recommended.